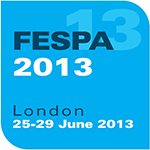 We will be exhibiting at the FESPA London Trade show which will run from 25th to 29th June 2013. It will be taking place at the ExCel London Exhibition Centre, London E16 1XL. We hope to see you there. For more information on the show, please click the show logo below.